Like every Angeleno, I use the crap out of my car, but before this weekend I’d never been to an auto show. 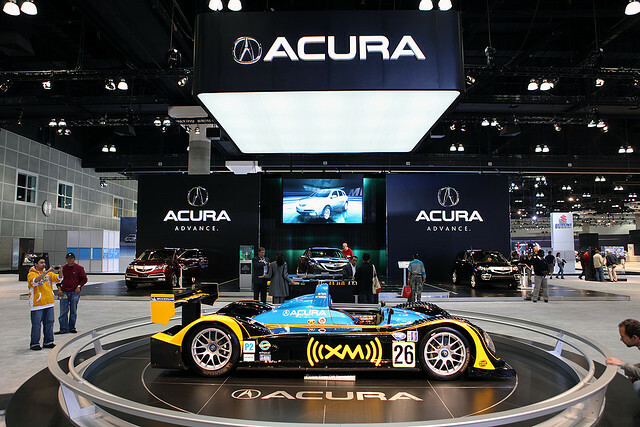 I suppose I expected scantily clad women draped across car hoods and hordes of men gawking at them, but the LA Auto Show wasn’t like that at all. Sure, in the Convention Center’s lower hall, where a lot of souped-up, fast-and-furious types of cars were on display, the women exhibitors wore really short dresses and really tall heels, but as I moved upstairs into the upscale parts, the amount of clothing kept increasing. Smart business suits were the norm. And families were a lot more common than gawking men. It was crowded. The line to get in was as bad as Boulevard3 on a Friday night, but the age of the crowd was a lot more varied–from babies in strollers to senior citizens in Hawaiian shirts. All were there to check out the hot new cars and fanciful concept cars. I was there because I’d never been. Once I got in–man, was it crowded. The lines didn’t stop. Everything pretty much felt like a huge waiting game. When three o’clock rolled around and I sought out a Starbucks, the line was so long I had to give up. Seeing the coolest cars was also hard, because there were always scores of people in front of me. I did manage to get some glimpses by jumping up and down (I’m 4’11″), but I’m not sure that’s an ideal museum experience. I don’t think people do that at the Louvre, for example. Still, aside from some of the hassles I had to navigate, a lot of interesting stuff was on view. Most of the displays were so bright, and almost hypnotic, that I found myself walking toward them without even noticing my movements. Subaru, Volkswagen, and Audi all put their cars under bright lights against white backgrounds that were somehow futuristic and alluring. Volvo, in a unique touch, eschewed the whites and brights in favor of an attractive wood-and-glass gallery. The Mini Cooper exhibit also stood out, using darkness rather than light to set itself apart. Several Mini Coopers were mounted to the wall, as if they were driving straight up to the ceiling, and their roofs had been turned into monitors displaying information about the cars. The Concourse Hall was full of ridiculously expensive vehicles like Aston Martins, Bentleys, Rolls-Royces, Lotuses, and brands I had never even known existed. I loved just checking out the price points of the cars–one of the Aston Martins cost over $280,000, a price I found hard to believe–and I liked their elegant, vintage looks. In general, I prefer simplicity and timelessness, so I found myself especially appreciating the cars with long hoods, long bodies, and long histories. My favorites were from the Morgan Motor Company, a British make that I had never heard of. Not everything was beautiful. I was disappointed to see several old Chevrolet convertibles that were painted a blinding shade of orange. Why would you ruin a classic like that? Sure, a classic loud color like cherry red–that’s fine. But if you’re finding yourself drawn to hot-pink or highlighter-yellow, then maybe you should run around the block or just get some fresh air. Something’s not right with you. Also, the Fast and the Furious-esque cars did nothing for me. Does your car have to be that fast? Or that loud? These cars literally roar past you on the freeway. They command your attention, whether you like it or not. And I don’t like it. Still, I was entertained and busy the entire time. Plus there was the free stuff in the Kids Fun Zone section. It was meant for moms and toddlers, I admit, but the line was so long that by the time I got to the front of it I wasn’t about to walk away. My wait was rewarded with an opportunity to dig through a bag of small prizes, and, after searching in vain for a plastic tumbler, I settled on a reusable water bottle. One of the staffers told me, somewhat consolingly, that it changes colors, “like a mood ring.” Meanwhile, my sister won a t-shirt and my brother won some magnets, so they did all right. Thank you, State Farm Insurance, for the free stuff. I may not understand the hoopla over a V6 engine or the importance of a dual-exhaust system, but I do appreciate cars and the car community a little more than I did before. And the reusable water bottle does indeed change colors. Monette Borigsay is an intern at Zócalo Public Square. *Photo courtesy of Rance Costa.